Ah, yes, wouldn’t it be great to be received with that kind of palpable jubilation every time you set foot in the local watering hole? Where just walking through the door stirs up the enthusiasm like leaves on a country road, fluttering in the wake of a fast car? Where everybody’s glad you came? When it comes right down to it, don’t you wanna be where everybody knows your name? Years ago, in my twenties, I did experience that sort of instant, joyous recognition, albeit vicariously. At the time, I lived in the same low-rise apartment building as my friend Babe. We were sort of like Mary and Rhoda (whom I seem to refer to rather a lot lately, don’t you think? ), since my apartment was situated (literally) directly above hers . We’d often dash up and down the single staircase between floors to visit each other’s place, to share dinner or to jointly watch our soap in the evenings (at the time, Babe had both gainful employment and a VCR–both of which I lacked). Once in a while, we’d head out to dinner at one of the neighborhood haunts, living as we did in the part of town affectionately known as “Yonge and Eligible”, near so many good restaurants. And no matter where we went–be it Chinese, Italian, Greek, Pastry Shop, Juice Bar–the owner of the joint would brighten visibly when my friend entered, and, wiping his hands on his apron and gesturing with a flourish, would greet her with a most animated shout of “BABE! !” before positioning us in a prime seat in the restaurant. (Well, in the interest of verisimilitude, I should admit that he didn’t actually call her “Babe,” of course, because (a) that would make him sound far too much like Sonny Bono; (b) this is a dramatization, and that’s not her real name, but a pseudonym; and (c) calling a woman “Babe,” even if this scene supposedly took place in the 1980s, would be horribly sexist, and we’ll have none of that type of thing on this blog.) More often that not, we were also presented with a complimenatry appetizer, or gratis aperatif, or dessert on the house . . . needless to say, I loved basking in the glow of my friend’s semi-celebrity status and thoroughly enjoyed the perks of stardom, even if only by propinquity. One of the places we frequented was Grazie, a compact Italian bistro with about a dozen seats, scratchy wooden floors and a jovial staff who served the best fresh pastas I’d ever had (a testament to its appeal: the place still exists–albeit in a larger and more commercial incarnation–and is still bustling and bursting with patrons each night, almost 20 years later). When I think of polenta, I think of Grazie. Admittedly, that wasn’t always the case; it took some convincing for me to try the cornmeal-based appetizer, as my only other experience with the stuff was a kind of gruel my mother served for breakfast when I was a kid. Into the soft, yellow mush, Mom would swirl large-curd cottage cheese, resulting in whorls of white, slightly soured lumps distributed throughout, vaguely resembling the wiggly larvae you find in infested apples. My parents called this “Spoon Bread,” and while my dad loved it, in me it always elicited a slight wave of nausea. (Oh, wait. Even just thinking about it–excuse me for a moment). So when I learned that polenta was thick-cooked cornmeal, cooled and often cut into disks, I was a bit reluctant. I did fancy Grazie’s fresh tomato sauce with basil mounded atop the offending polenta, however, so I decided to give it a try anyway. (I mean, would my friend Babe, the star customer, the very mascot of the place, steer me wrong?) Of course, I was completely enchanted. Once I realized that polenta didn’t need to be sweet, didn’t need to contain cottage cheese, and–most important–didn’t need to be soft and mushy, I was on a mission to create as many polenta dishes as I could. And I’ve been experimenting ever since. It seemed the perfection occasion, a couple of weeks ago when our friends Gemini II and her husband came to dinner, to make a recipe for Herbed Polenta Appetizers from the glorious New Vegetarian Entertaining by Jane Noraika. This is the kind of book that you want to savor, leaf ing through it slowly and deliberately, imprinting every image on your mind like the photos from your first trip abroad. The original recipe contained feta cheese, but, since I wanted to try out the “Feta-ish” from Alisa Fleming’s new book, Go Dairy Free, I decided to use that in place of the dairy version. The result was a perfect finger food–a firm, smooth polenta base suffused with fresh dill and salty, briny feta, all topped with a slightly sweet, slightly sour sundried tomato tapenade. And I should note that no one realized this was vegan. These bites are also a feast for the eyes, with their sunny yellow, bright green and creamy white base, and mound of deep carmine capped off with a black olive slice. The four of us had no trouble polishing off the entire tray (16 pieces!!) in no time, and probably would have eaten more, if there had been any. Maybe the owners of the local Italian resto don’t recognize me quite yet, and maybe I’ll never acquire the mysterious allure of my friend Babe. But after the appreciative reception I got for these delectable squares, I started to feel a little bit like Norm, after all. With all the herby goodness going on in these bites, I thought this would be the perfect submission to Weekend Herb Blogging, organized by Haalo and this week hosted by Marija of Palachinka. The original recipe calls for cutting the large polenta block into 2-inch (10 cm) rounds with cookie cutters, but because I’m basically lazy (and I’m just not Lolo), I decided to cut the slab into squares. I have to admit that the rounds did look fetching, though. Make the polenta: Line an 8 x 8″ (20 cm) square pan with parchment paper or spray with nonstick spray. Set aside. Heat the oil over medium heat in a nonstick frypan or saucepan. Add the garlic and scallions and cook for 10 minutes or so, until the onions are translucent. Pour in 1-1/4 cups (300 ml) boiling water, then add the polenta in a steady stream, whisking to prevent lumps. Continue cooking according to package directions (probably for 20 minutes or so, over low heat, stirring constantly, until the polenta is very thick). Remove from heat and gently stir in the feta and dill; add salt and pepper to taste. Pour into the prepared pan, cover with plastic wrap and chill at least 6 hours, or overnight. Meanwhile, make the tapenade: Drain the soaked tomatoes and place in a blender or mini food processor with the 1/4 cup (60 ml) olive oil, vinegar, chile, and basil. Process until fairly smooth. Store in a covered jar in the refrigerator until ready to use. To assemble: Remove the plastic wrap and place a cutting board over the top of the pan. Holding them tightly together, flip them both over so that the pan is on top and the polenta falls out onto the board. Peel away parchment. Cut the square of polenta into 16 or 25 smaller squares, depending on how large you’d like them to be. (The original recipe asked you to cut them into rounds with mini cookie cutters, but since I’m lazy and not as talented as Lolo, I just cut them in squares). Top each with a generous spoonful of tapenade and a few slices of black olives. Garnish with a touch more dill, if desired. Oh man, Oh man, Oh man. This looks so damn good! I second Shelby’s comment. They look very savory. What’s even better is that they are healthy, too. Feta is expensive down here, so I’m excited about making the fake feta. Lemon juice was a logical choice! The spoon bread sounds…uh…not so good. Stunning! I love how you tucked the dill into the little olive slice. Like Jes, I was just thinking that these might work for tomorrow’s game. Then I remembered that my guests will only be interested in beer, chips, burgers (hello, veggie burgers) and sweet treats. Nothing fancy for this lazy Sunday crowd…ah well, wouldn’t want to waste these lovely appetizers on them anyway! sweet jeebus, these look absolutely amazing, Ricki! thanks for another rock’n recipe! This looks amazing. I love polenta but always end of just putting it on a plate under a yummy topping. I never get around to leting it firm up so I can cut it into shapes — but I want to. I have the perfect occasion coming up to try these. Well, I sure hope it was an important visitor! Just kidding. I experienced a bit of that Cheers atmosphere living in North Lake Tahoe, it was quite amusing. Though I’ve never watched a Superbowl game myself, that’s what I’ve heard, too, about the audience. . . I guess polenta wouldn’t be great at any sporting event, actually! Sounds like your eats will be equally yummy, and more game-appropriate! Thanks! Why pull out the cookie cutters when you don’t have to? Besides, squares have more surface area = more to eat!! love those photos ricki! it just looks so tempting. I always think of preparing polenta this way as needing frying or grilling (broiling) after it sets but this looks great without that extra effort! And does the recipe have suggestions for offcuts if you do use round cutters – this is one of the advantages of squares – no waste! Those look very professional. They look just like an hors d’oeuvre you’d be served at a fancy cocktail party. They sound tasty too! you are so talented and i love the background story you shared with us! how adorable! What a beautiful appetizer idea! I love polenta. The Brazilians around here seem to prefer it fried. You can find it on pratically every menu. I like it cooled and cut with great ingredients like this. Very chic little tidbits, Ricki! I love polenta – so much easier than short crust and w/ hardly any fat. feta and polenta sound like they’d be perfect together! wow these look fancy! i love how square they are! You got me drooling with this one and I just had breakfast:)! Thanks for those links – I needed one for tofu feta! I agree circles would have been nicer to look at but doesn’t really matter! Ricki – what a lovely appetiser this is. I do like the way you’ve angled the dill garnish through the olive. Really exceptional appetizer! You could serve this to a king! These look so good, and definitely an impressive party nibble! I do love tofu feta, too. This looks incredible. I am in love with firm polenta and have been hunting for a good recipe. And what an unusual tapenade! Once hung out in a pub in the back streets of Newtown in Sydney where many people knew my name. Thing is, I kinda wished some of them didn’t! 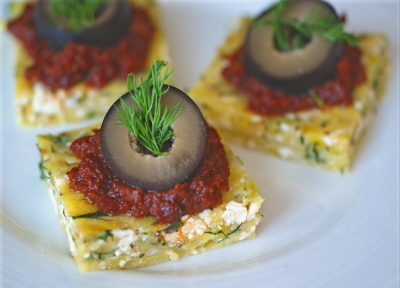 These polenta appetizers look great! Some of my favorite flavours here! What a delightful appetizer. And so pretty too. What size pan? And how should it be prepared? must make this soon! must go buy dill. drooling on keyboard. 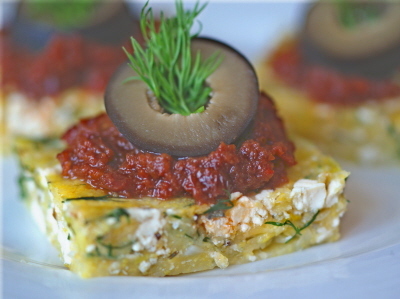 i love polenta and i never thought of using it as an appetizer. how creative. and the olive tapenade… mmm. mmm.